At the turn of the 19th century William F. Brossman and his family resided on Sunnyside Farm near Red Run in Brecknock Township, PA. Mr. Brossman was a successful fertilizer salesman who became interested and reliant on budding telephone technology to communicate with his customers. Frustration with the not-so-farm-like hours kept by the Lancaster based operators was the driving force behind what would become Denver and Ephrata Telephone and Telegraph Company. The D & E Telephone and Telegraph Company was officially formed in 1911. Mr. Brossman built the company with hard work and an unrivaled commitment to service of his customers. He instilled those values in his family and a company that grew to be a community staple over the next 95 years. 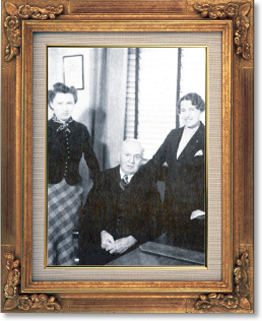 William Brossman’s daughters Bertha and Anne, respectively, would both serve as President of D & E Telephone Company in the years to come. The Brossman family has exemplified community service and giving in the D & E community. The Anne Brossman Sweigart Charitable Foundation continues the tradition of supporting the community that supported them.